When opposing coaches talk about playing against the Carolina Preps the first they mention is the twins (Kobe and Keyshaun Langley). This backcourt has led the Carolina group to this year’s National Championship and numerous final fours in the past. The twin’s father and coach Keyford Langley knew very early on that this duo was special.” I knew at the age 2 that they were special. They could play all sports and excelled. Later on they hooked with the late Mike Harris, a trainer that ran camps. They attended his camps and were able to perform well against older competition. They were able to shoot on 10 ft. baskets while others their age shot on 8 ft. buckets. The look in their eyes told me they wanted to be special” said Keyford. Most people including their dad can tell the twins apart because of their talents. “Their games are as different as night and day. Keyshaun is right handed and Kobe is a lefty. Keyshaun is more of a floor general. He does all the intangibles. He is relentless on the defensive end and puts pressure on the opposing team’s defense with how he likes to attack the lane. He is the coach on the floor. Keyshaun makes everyone around him better. He often gets overlooked b/c he does not score 15-20 pts., but he is a winner and is not concerned about who gets the credit. Kobe is a scoring machine. He is what basketball people call a “shot-maker”. He hates to lose at anything. Kobe is more athletic and he will take more chances on both ends of the floor. Kobe has a motor and gives 100% on both ends” said Langley. Even though his sons have received early success the elder Langley knows there’s a lot of ahead for the pair. 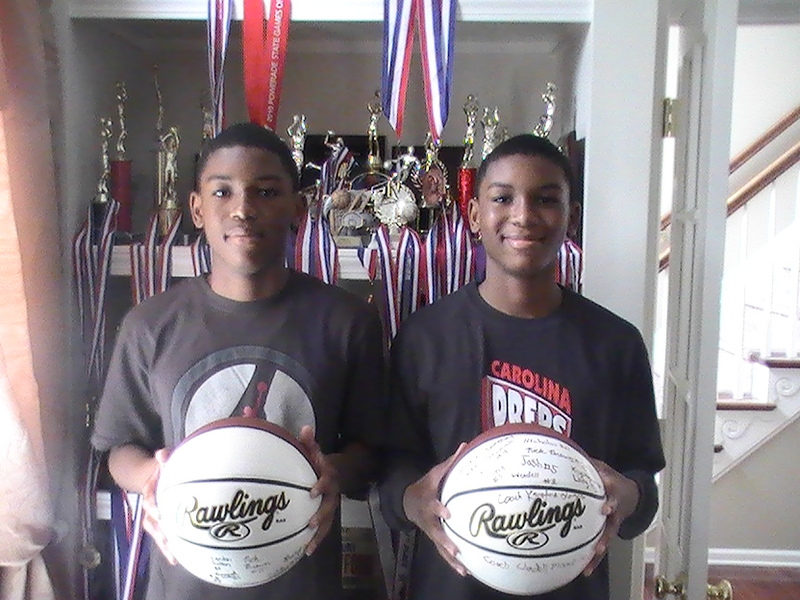 “Keeping them grounded has been easy because their older brothers (KJ and Kam) push them hard in workouts. Also my wife and I have a small circle around them who help in their development including future UNC commit Theo Pinson, Cousin Keith Gatlin, Karolina Diamonds coach Kevin Graves, my brother Lenny, nephew (DJ) who plays college ball and several area high school coaches. In terms of improving both of them need to get stronger. Individually, Keyshaun needs to be more of a threat from the 3 point line. His ball handling needs to be tighter as well. Kobe needs to tighten his handle as well and be able to run the team as a point guard" he continued. While many scouts and analyst have the twins certified stars of the future their father/coach remains humble about their peaking point. “I’m not sure where these two will top off. I think the sky is the limit for them as long as they continue to develop. Both have a strong skill set and the will to get better. They are honor roll students with high characters. With God, all things are possible” Lanlgey finished. Basketball Spotlight would like to congratulate the Langley’s on their success and we look forward to seeing them next year on the Basketball Spotlight circuit.